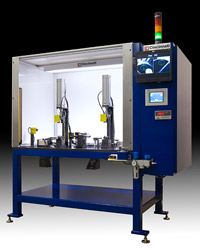 This Automated System was designed to assemble and inspect two models of stabilizer bars. Metal clamps were loaded into two nests that had automatic holding gripper pads. Insulators were loaded into 2 nests that had automatic swing opening devices to allow for bar insertion. A two-camera Keyence vision system was programmed to verify correct insulator and orientation prior to assembly. Stabilizer bars were loaded into the insulators and the OD was measured using a Keyence laser micrometer before continuing assembly. If all conditions passed, the system automatically pressed the two clamps over the two insulators and around the bar. The vision system executed a second inspection program to verify correct assembly. The bar code scanner verified correct part number label on bar. If all conditions passed, the stabilizer bar assembly was released to the operator. Otherwise, the assembly was held in station until the rejected feature was corrected by the operator. Machine status and functions were displayed on an 8" color touch screen HMI. A Siemens PLC controlled all machine operations.